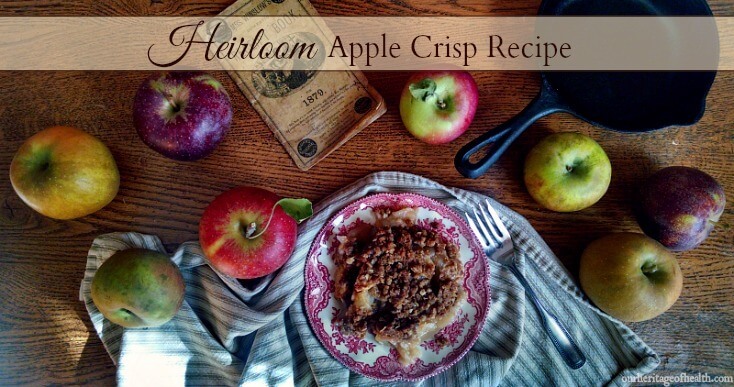 Apple crisp is a delicious fall dessert no matter what type of apples you use, and you can certainly make this recipe with any of the usual apple varieties you normally find at Pick-Your-Own apple orchards, farm stands, or at grocery stores. If you’re able to find them, though, I think that using some unique heirloom apple varieties adds a depth of flavor to the recipe, not to mention the fact that it’s a lot of fun to try some of the more rare and obscure varieties that aren’t just the same couple of varieties you see everywhere this time of year. 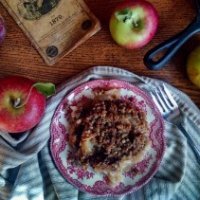 There are hundreds of different apple varieties (and there used to be even more varieties in previous centuries, but sadly some of those varieties are extinct now), and some of those antique apple varieties have amazingly complex flavors that make them perfect for eating out of hand or baking with them. And if you’re a history lover like I am, it’s really neat to be able to taste some of the nearly forgotten varieties that were popular a couple of hundred years ago. 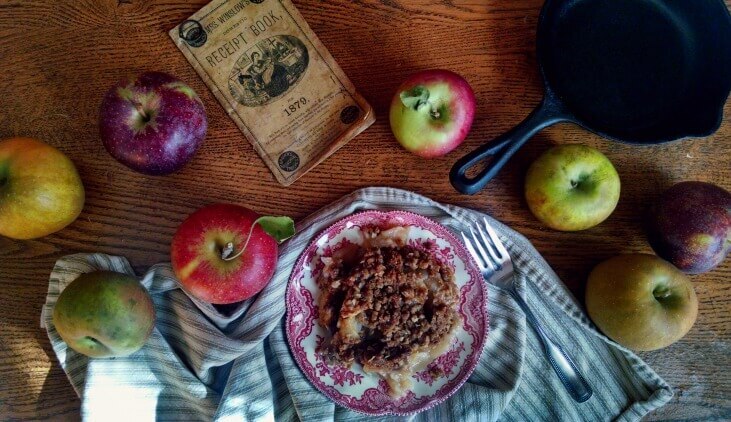 Whether or not you have access to heirloom apple varieties where you live, though, I think one of the keys to having a really good flavor in your apple crisp is to use a couple of different varieties of apples. This will give your crisp a nice balance of tart, sweet, spicy, etc. 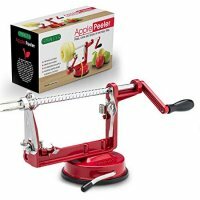 rather than the one-dimensional flavor you get from just using one type of apple. It’s also usually a good idea to use firmer apples rather than softer apples if you like your apples to keep their shape when baking and to have a firmer texture rather than turning to mush once they go in the oven. A few heirloom varieties that are great for baking with are Baldwin, Rhode Island Greening, Roxbury Russet, Newton Pippin, Northern Spy, Gravenstein, and lots more! 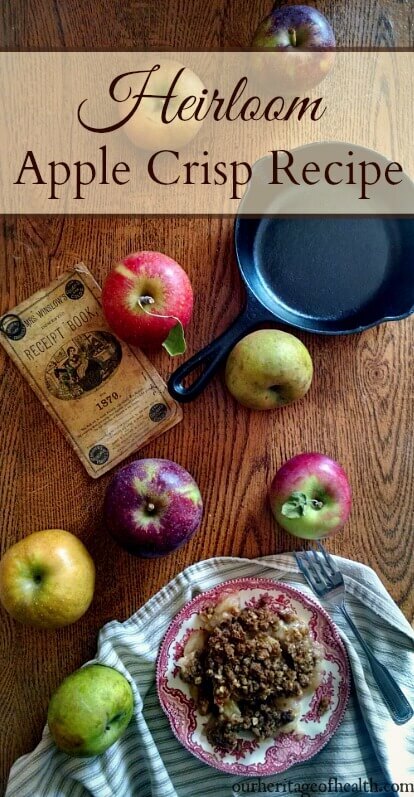 I had several early season apples when I was making my crisp, so I used a lot of Gravenstein and Hubbardston Nonesuch apples with a few Ribston Pippins and Esopus Spitzenburgs mixed in. 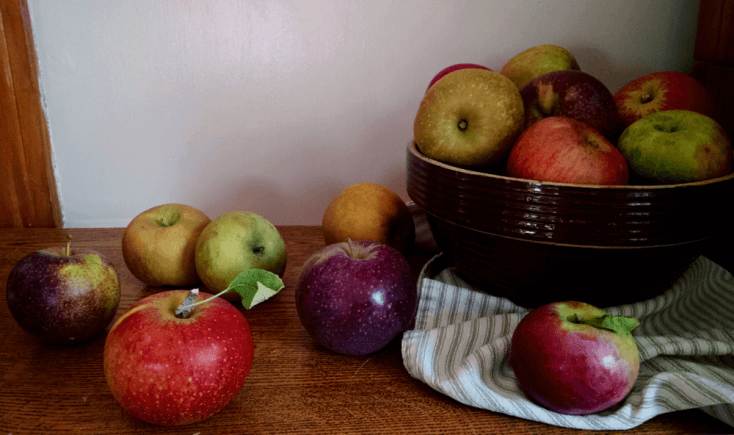 Later on in the season, I want to do some more baking with some of the later season varieties like Baldwin, Roxbury Russet, and Newtown Pippin. Depending on what apples are available near where you live, it’s fun to play around with using different varieties to see which ones you like the best in your apple crisp. 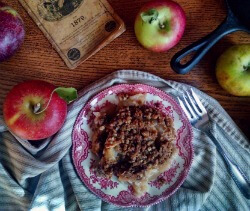 This old-fashioned apple crisp recipe is the perfect blend of fresh apples and warm autumn spices. Choosing a variety of unique apples, like heirloom apples, gives this apple crisp a depth of flavors with a good balance between tart and sweet. In a mixing bowl, blend together all dry ingredients (flour, oats, sugar, salt, and spices) and mix well to combine. Add the melted butter to the dry ingredients and mix well together. Peel, core, and slice the apples and layer them in a 9X13 inch baking pan. Sprinkle crumble mixture over apples, distributing evenly. Bake at 375 degrees for about 30 minutes or until apples are bubbling and crumble topping is golden brown.